Browse > Home / Discounts / Free Shipping to Hawaii! Anyone who is from Hawaii or who has lived there for any period of time get’s tired of being grouped together with Alaska on the short end of the stick when it comes to various deals offered to the rest of the United States. We have all seen it in the fine print of ads or heard it right at the end of a TV commercial when the words come out: “This offer valid only in the 48 contiguous states, Hawaii and Alaska extra.” What’s up with that? We don’t think it’s fair which is why we are offering free shipping to Hawaii on any order over $25. 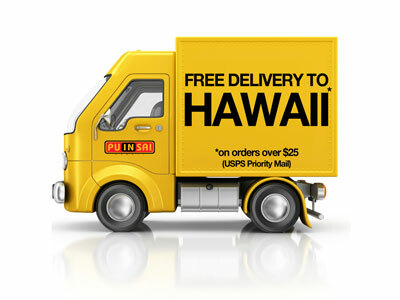 As long as your “ship to” address is somewhere in the state of Hawaii, you will see the option for Free Shipping via USPS Priority Mail when you check out. No need to enter a coupon or do anything special. Now if only other companies would follow suit. Filed under Discounts. You can follow any responses to this entry through the RSS 2.0 feed. Responses are currently closed, but you can trackback from your own site.